The law being challenged was passed by anti-gun Connecticut legislators and signed by an anti-gun Governor, riding a wave of hysteria following the December 2012 mass murder of elementary school children in Newtown, Connecticut. Those supporting the law claimed that to stop the violence “military style” weapons must be banned. On the same day that we filed our brief, in Santa Barbara, California — the state which proudly claims to have the strictest anti-gun laws in the nation — another mentally deranged young male demonstrated that the problem is not guns. Indeed, in Santa Barbara, the shootings took place over a 10-minute period, during which there were no armed civilians who could take action to stop the shooter. The only gun problem is laws keeping guns from law abiding citizens. In court, Connecticut made the old, tired arguments that the ban is necessary to protect the police and further public safety. The district judge agreed. Despite finding that the ban “substantially burdened” the Second Amendment right to keep and bear arms, he felt the burden was not unreasonable in light of the competing public interest. Even though rejected by the U.S. Supreme Court in the Heller case, the district court used a judge-empowering “balancing test” to justify the ban. Under this “test” barred access to semiautomatic weapons that even the trial judge admitted were constitutionally protected arms. Our brief argued that the judicial standard of review for Second Amendment cases is the amendment’s text itself — “shall not be infringed.” If (i) a person is part of “the people,” (ii) a firearm is an “arm,” and (iii) the activity involves “keeping” or “bearing” — then the right is absolute, not subject to balancing against the interests the government has in violating the right. Since it is abundantly clear that these requirements are met in this case, the Connecticut ban must be struck down. It does not matter if the state provides “alternate access to similar firearms.” It is up to the American people, not the government, to choose which weapons “secure” a “free state” against tyrants — the stated purpose of the Second Amendment. 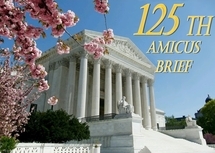 Our brief was filed on behalf of: Gun Owners of America, Inc., Gun Owners Foundation, U.S. Justice Foundation, Oregon Firearms Educational Foundation, The Lincoln Institute for Research and Education, The Abraham Lincoln Foundation for Public Policy Research, Institute on the Constitution, Conservative Legal Defense and Education Fund, and Policy Analysis Center.